The incident took place just ahead of Frecce Tricolori airshow when two members of the QBR, "Goodfellas", amateur sports team were performing stunts in their two-seater propeller planes. The airshow scheduled later for Sunday was canceled. “We saw two planes flying at low altitude and not very fast. When they clashed we heard a bang and within seconds they had fallen into the sea, not far from the shoreline,” Marco Valenti told local news. According to local authorities, a 47- year old pilot from Sienna, Marco Ricci, died in the crash. He was found dead under the fuselage of his plane about 2 kilometers offshore, according to Teramo’s fire department. His body was recovered by divers who first used an air balloon to resurface the plane, before pulling the light aircraft ashore. 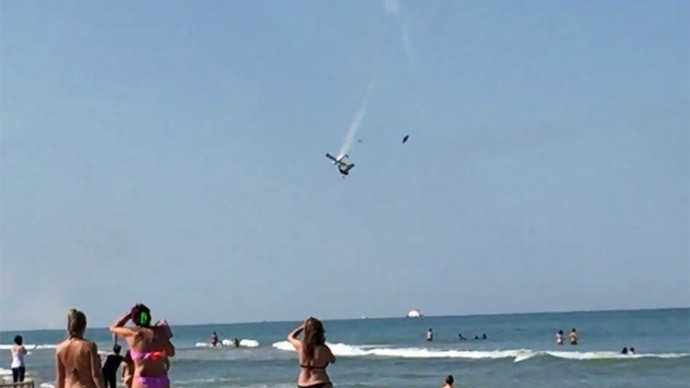 The other pilot, Luigi Wilmo Franceschetti, 43, performed an emergency landing on the beach and managed to survive. He has now been hospitalized with only minor injuries. An investigation has been opened into the crash, the Flight Safety Agency (ANSV) , deputy prosecutor of Teramo, Stefano Giovagnoni announced, adding that the surviving pilot is now a suspect in a manslaughter case.